Manuel Noriega has been in prison since his grandson, now 20, was 4 months old. Miami, Florida (CNN) -- Growing up, Jean-Manuel Beauchamp attended no ball games with his grandfather. No barbecues, either, or bedtime stories. Beauchamp, now 20, was 4 months old when the United States invaded Panama and seized his grandfather. Noriega was later convicted on drug charges and sentenced to 30 years in prison, reduced to 17 for good behavior. Now, three years after the end of his prison term, Beauchamp's grandad -- former Panamanian military dictator Manuel Noriega -- remains behind bars pending Secretary of State Hillary Clinton's decision whether to sign extradition documents. That outcome will likely come sooner rather than later. The U.S. Supreme Court on Monday turned down Noriega's request for a new hearing, setting the stage for his extradition to France, where he has been convicted in abstentia on money laundering charges and faces a new trial. "It's all up to Hillary now," Beauchamp said. "There's not much hope in the courts any longer." President Obama has a role to play as well, Beauchamp said, but he held out little hope that the president would intercede. "I don't think he's being informed about this case, and it's still being ignored, just like the Bush administration did," he said. "I'm trying not to let this affect me. I just got off the phone with my grandfather. He was adamant about making this injustice known," he said. Noriega's Miami attorneys plan to send Clinton a letter Friday asking that the former Panamanian strongman be returned to his home country of Panama. Noriega's trial judge declared him a prisoner of war after his drug and money laundering conviction in 1992. Because of that status, he and his attorneys believe he should have been returned to Panama -- where he would face murder charges -- when his sentence ended in 2007. But the federal courts have ruled against him, and he has remained in prison south of Miami. "He was adamant about staying in Miami this whole time," said Beauchamp. "His attitude now is 'whatever happens happens.' "
Noriega is charged in France with depositing drug money in French banks and using drug money to buy apartments in Paris. He faces up to 10 years in prison there, but his attorneys believe France would not honor his status as a prisoner of war. He faces 20 years on murder and human rights abuse charges in Panama, but Panamanian law would allow him to serve his sentence under house arrest because of his age. The United States holds his fate and must decide whether to honor France's extradition request or send Noriega home. "They must also consider the seriousness of the charges," said Jon May, Noriega's appellate attorney. "Noriega is wanted for murder in Panama. We're not asking for sympathy from Secretary Clinton, but to recognize there are larger issues," he said. Further, he said, "Panama made the request first, and he is a citizen of Panama, not France." Beauchamp also believes that Panama's case should come first, but he is willing to go with his grandfather wherever he's sent. "I told him I will follow him to be with him there, in France, but he said, no, I should stay and work on my studies," said Beauchamp. Beauchamp is a film student in New York. He says that he doesn't know anything about his grandfather's past or the drug charges that put him in prison. He was far too young to hear the stories about how Manuel Noriega was once on the CIA's payroll. "When I was a kid, I didn't grow up knowing he was in prison. I thought he was in school," said Beauchamp. The two have spent quite a bit of time talking both in person and on the phone. Beauchamp said they talk about the present, not the past, and his famous grandfather has motivated him, helping him learn from his own experiences. "I've spent quality time with him, but not private time," he said, alluding to prison security and the monitoring of conversations. "He's the smartest man I know. He's so friendly, outgoing, knowledgable. He's always looking to teach or give advice," he said. The U.S. government has portrayed Noriega as the ultimate crooked cop -- a man who was paid millions by the Medellin drug cartel to protect cocaine and money shipments. Panamanians remember him as a cruel dictator. 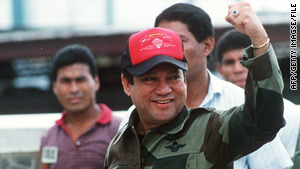 But the former Panamanian leader has said his relationship with the United States soured when he refused to help the United States take part in acts of sabotage against the communist Nicaraguan government during the Cold War-era, anti-communist efforts spearheaded by the CIA in Central America during the 1980s. Noriega said that when he refused to help the United States, his country was invaded. Noriega was arrested and taken to Miami to stand trial on the drug charges. During the invasion, 23 U.S. troops were killed, as were about 200 Panamanian citizens. Beauchamp said he wants to learn more about his homeland of Panama. He grew up in Miami, but his sense is that Panama never really wanted his grandfather back there to stand trial and is still reeling from the 1989 U.S. invasion. "Panama needs closure, and I feel Panama has not wanted him back. Panama is still suffering from post-traumatic stress disorder," he said. In the meantime, Beauchamp said that his grandfather reads and prays a lot and still has a soldier's mentality. "He's ready for anything. He's probably developed strategies, in his own mind, to emotionally prepare. He's been packed for 2½ years waiting," he said. "The U.S. should be escorting him back to Panama, from where they took him."